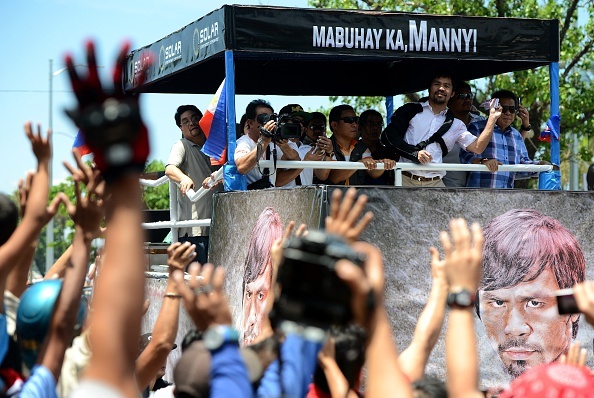 Filipino boxing icon Emmanuel "Manny" Pacquiao has returned to a hero's welcome in Manila despite his defeat by American champion Floyd Mayweather Jr. in the May 2 bout in Las Vegas. Pacquiao had a motorcade ride after his arrival from the United States on Wednesday, and called on President Benigno S. Aquino III in Malacanang, the presidential palace. The 36-year-old boxer, who is also a congressman of Sarangani province in southern Philippines, said his immediate plan is to take some rest and let his injured left shoulder, which had undergone a surgery, recuperate. Pacquiao, wearing a black shoulder brace and arm sling, is facing class suits in the United States for allegedly hiding his shoulder injury prior to his fight.